My birthday is coming up hence this post is rather timely. Yes, I’m a 90s baby. I love statement pieces. Mostly because there are so many different way a statement can be made. The presence a size has is undeniable – a big necklace, a big purse or ultra high heels always stand out. No need to tell you that anything bright always draws the eye to itself. It is especially true in the pool of black, grey and neutrals we are all (myself included) so fond of. But I can’t stress enough how important it is to have some color in your wardrobe. It allows you to be brave, experiment and express yourself in a different way than plains and pastels allow for. If you’re too afraid or not ready to wow with size or color, a print can be a good way to start playing. Be it a pattern on your skirt or a cheeky phrase on your shirt, prints are an awesome way to show a little personality without “saying” much. I myself am not the biggest fan of loud pieces and even colour, but I did notice how adding those statement pieces to my wardrobe and getting a bit out of my comfort zone made dressing more fun and myself – more fearless. This red hoodie with a clear 90s baby print on it has become one of my favorite red items in my closet. For this look I paired it with Levi’s shorts and New Balance sneakers – perfect for those cooler end of summer nights that are inevitable at the end of August. I love the sneakers for daily wear around the city! Was so glad to find a black pair that works with a sporty outfit as well as with a classier pant or even a skirt/dress. 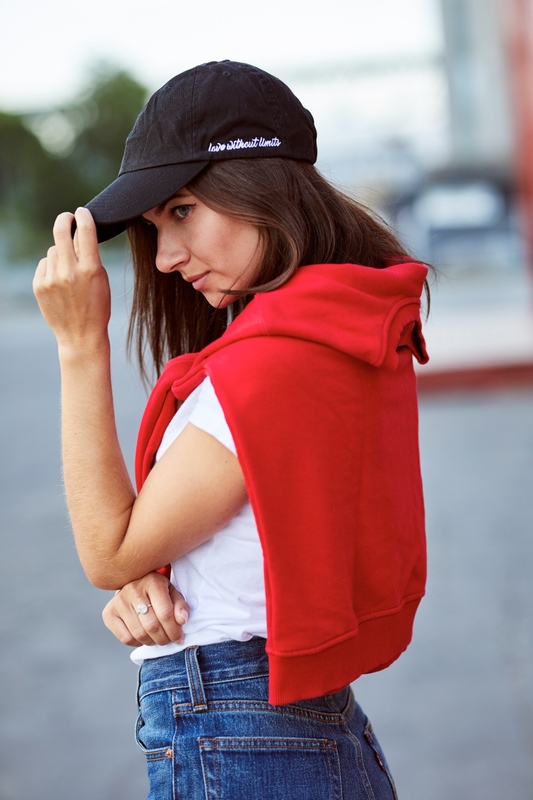 To complete the “girl from the block” look I threw on a hat from one of my favorite local Canadian brands – The Roster. The Roster was founded by my very inspiring friend Taylor and is associated with a non-profit which helps girls facilitate a positive self-esteem. Check them out and shop consciously!